Hickory smoked country style sliced bacon. Bacon’s not for just breakfast anymore. Something special is sizzling here folks. 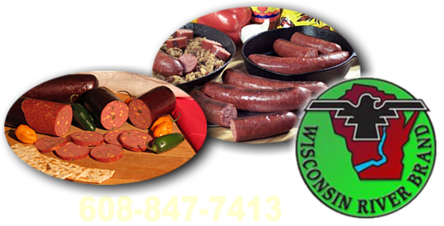 Wisconsin River Meats bacon is produced from locally raised all natural piggys. Our slabs are hand trimmed and home cured with our own maple sugar cure. These lean slabs are then slow cooked over natural hickory. This original bacon is bursting with rich and hearty country flavor. 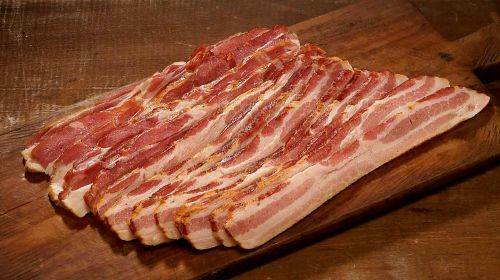 Medium sliced, Wisconsin River Meats country bacon is great to serve over warm biscuits or burgers. Great for breakfast or to top off any meal. Crumble in your favorite salad and use the drippings for your favorite flavored gravy. What ever the situation, bacon makes a good case. 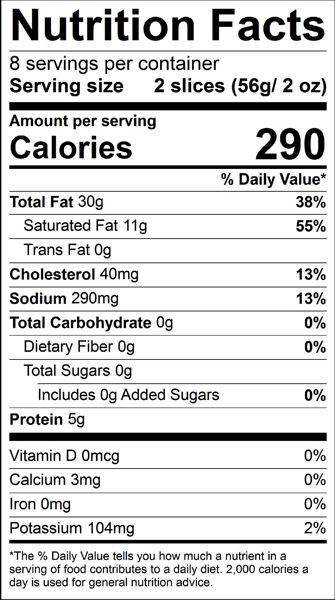 Ingredients: Water, salt, sugar, maple syrup, flavorings, sodium erythorbate, sodium nitrite. Our products are made in the traditional old world style with no added preservatives. It is the reason our products are of such high quality and taste so good. This also means that proper care must be taken when handling your products to ensure a positive experience for all. Your products are processed to be shelf stable for shipping. Refrigeration is not required for transportation purposes. Products should be refrigerated upon receipt. Products not to be consumed within a few weeks can and should be frozen for up to few months (this will not affect taste or texture). Opened packages should be consumed within one week. We are confident that the exceptional flavor and quality will keep you coming back, telling people about us and ordering for your friends, family members, and our brave military personnel. Leave your products in the vacuum sealed packages they come in. Consume any packages with broken seals from transportation first. Refrigerate or freeze products immediately upon receipt. Store vacuum sealed packages in the refrigerator or freezer, keep away from light sources as much as possible, and consume within a few weeks. After opening vacuum package remove the remainder of the packaged product. Wipe excess moisture off product before rewrapping tightly to keep air, light and moisture out. Products can be frozen for a few months without affecting taste or texture. Some folks like to dry landjaeger and summer sausage further before consuming. As sausage dries moisture is lost, the texture becomes firmer and the flavor intensifies. Be careful not to contaminate the product. Proper storage and prompt consumption will eliminate most sources of sausage spoilage. If, despite of proper handing, sausage looks or smells spoiled, use common sense and discard. We are in Barbados so it's not the new year yet! Thanks so much for everything! We really enjoyed the bacon last time and can't wait for more! It's great to be able to get good ole fashion American style bacon while living overseas. The bacon at the local groceries just doesn't taste the same. My girls were so excited when the first order came in. It makes for a great weekend breakfast treat. Wow, I was prepared to ship the sausages back, but you added more cheers to our Holidays with your gift! Thank you for your kindness! The texture was great. It cooked up perfectly. However, this bacon is very, very salty tasting. If you like that, then go for it. We are serving with NASA over here in Moscow, Russia and can't wait to try your products! SO excited for real bacon!!!! Thanks for doing what you do. Service Area: Mauston, Wisconsin Rapids, Sparta, Portage, Waunakee, Nekoosa, Lodi, Pardeeville, Poynette, Cross Plains, New Lisbon and surrounding communities.